T. J. O’Mara and Kaskade. Photos copyright Sportfot. Wellington, FL – March 25, 2016 – Week eleven of the 2016 Winter Equestrian Festival (WEF) continued on Friday with a win for T. J. O’Mara riding Kaskade in the Ninth Annual George H. Morris Excellence in Equitation Championship and victory for Darragh Kenny (IRL) and Chanel in the $35,000 Illustrated Properties 1.45m Classic. WEF 11 features CSI 4* rated jumper and ‘AA’ rated hunter competition running March 23-27, 2016, at the Palm Beach International Equestrian Center (PBIEC). Saturday highlights the $50,000 Artisan Farms Under 25 Grand Prix Series Final, presented by Equiline, on the derby field at The Stadium at PBIEC beginning at 11:00 a.m. with a brunch hosted by Equiline in the Tiki Hut at The Stadium beginning at 10:30 a.m. The $130,000 Engel & Völkers Grand Prix CSI 4* will be the feature event in the International Ring on the main show grounds on Saturday evening beginning at 7:45 p.m.
Competition concludes on Sunday with the $86,000 Suncast® 1.50m Championship Jumper Classic also held on the derby field at The Stadium beginning at 11:30 a.m. 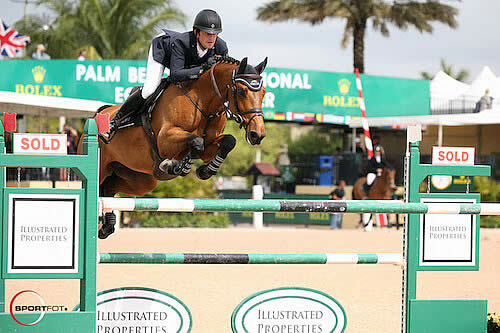 The 12-week WEF circuit continues through April 3 offering more than $9 million in prize money. The Ninth Annual George H. Morris Excellence in Equitation Championship was held in three rounds with 35 riders competing in round one. The top 15 returned for round two, and the top four rode for additional testing in round three to determine final placings. Course walk plans and schooling were the sole responsibility of the riders as competitors were allowed no contact with their trainers during the class, turned in their cell phones before the start of the class, and were responsible for time management, warm up, and schooling of their own horses with the assistance of one groom. Bobby Murphy designed the course, in conjunction with the judges. The riders were judged by two panels and also received a score in the schooling area after the first and second rounds. Judging Panel 1 included Jimmy Torano and Candice King; Panel 2 included Bobby Braswell and Chris Kappler, with Karen Golding as the Schooling Ring Judge. T. J. O’Mara led through both rounds to make it to the final four and come out on top riding Kaskade, a ten-year-old Dutch Warmblood mare. The rider earned the high score of 91.5 in round one and returned for round two to score a 92. His two round total of 183.5 combined with an excellent test in the final four put the rider in first place overall. McKayla Langmeier finished second riding Eclipse with scores of 91 and 83.75 for a 174.75 heading into the final four, and a bold test that was rewarded in the work-off. Sophie Michaels rode Acortair to third place honors, and Ava Stearns finished fourth aboard Micah. Judge Jimmy Torano spoke about the class and what went into the final decision on the top four placings. “I think it is a great class. This is the ninth year, and I think I have judged it seven times,” Torano noted. “I love judging these championship classes, and I think the format really makes the kids think for themselves. It is at the end of the circuit, and you are seeing the top riders. Especially when you got to the second round, and then you saw the top four work off, it was really some top riding from the kids. Commenting on his win, O’Mara stated, “It feels great. This is my third year doing the class and I have slowly moved up the ranks, so I am really happy. My horse felt great today, and I could not have asked for better rounds. Without trainers to tell the riders what to do, they had to work together to come up with a solid plan. Langmeier also worked together with her barn mates, and although she had a rail in the second round, she finished out strong in the work-off and was happy with her mount, Eclipse. “It is nice having a team to walk the course with you with all of the other juniors that qualified from your barn,” Langmeier noted. “It is like having multiple trainers with you. Along with the top prizes, several other awards were presented at the end of the evening. Sophie Michaels’ mount, Acortair, was named Best Turned Out Horse by the judges and her groom, Moses Hernandez, received a special prize to acknowledge his hard work. O’Mara’s mount, Kaskade, also received the award for Best Equitation Horse. Stacia Madden and Krista Freundlich received awards as the trainers of the winning rider. Special awards were also presented to the families of the champion and reserve champion, and the top eight trainers received prize money. Darragh Kenny (IRL) continued his recent string of successes at the Winter Equestrian Festival on Friday with a win in the $35,000 Illustrated Properties 1.45m Classic aboard Chanel for owner Kerry Ann, LLC. The pair bested a field of 59 over a one-round speed track built by course designer Olaf Petersen, Jr. (GER). From the 48th position in the order, Kenny and Chanel, an eight-year-old Oldenburg mare (Challan x Lordanos) stopped the clock in 62.43 seconds for the win. Two trips later, Andrew Ramsay (USA) set out to take the lead, but came up nearly two seconds short with a time of 64.88 seconds to settle for second place in the irons of The Doodle Group’s Cocq A Doodle. Abdel Said (EGY) and California took third in 65.39 seconds for owner American Equestrian Association II, LLC. Conor Swail (IRL) and Cita, owned by Ariel and Susan Grange, claimed fourth in 54.50 seconds, while Margie Engle (USA) and Elm Rock, LLC’s Böchmann’s Lazio rounded out the top five in 65.60 seconds. With two grand prix wins to his credit and coming off the heels of a victory in the $35,000 Ruby et Violette WEF Challenge Cup Round 11 on Thursday, Kenny is pleased with how the 2016 season is shaping up for him and his horses. Kenny got the ride on Chanel in September and has jumped the mare sparingly throughout the winter season with goals to produce it into a young rider mount for Kenny’s student and owner, Kerry McCahill. Week 11 of WEF is the first time Chanel has competed at the FEI level, and while Kenny has worked to perfect the mare’s rideability, he feels she has what it takes to be competitive at the top level. Also competing in the International Ring on Friday, the $6,000 Illustrated Properties 1.40m Speed Challenge saw a win for Lucas Porter (USA) and B Once Z, owned by Sleepy P Ranch, LLC. WEF 11 continues on Saturday with the $50,000 Artisan Farms Under 25 Grand Prix Series Final, presented by Equiline, on the derby field at The Stadium at PBIEC beginning at 11:10 a.m. with a brunch hosted by Equiline in the Tiki Hut at The Stadium beginning at 10:30 a.m. The $130,000 Engel & Völkers Grand Prix CSI 4* will be the feature event in the International Ring on the main show grounds on Saturday evening beginning at 7:45 p.m. For full results and more information, please visit www.pbiec.com.